Items in light green are currently available while those in white are in the planning stages right now. A “… candidate has hands-on experience using AWS services to design highly available, cost efficient, fault tolerant, and scalable distributed systems. Candidates have the ability to identify and define requirements for an AWs-based application, as well as follow best practices for building secure and reliable applications on the AWS platform. Single exam, 80 minutes, no prerequisites (Amazon recommends the Architecting on AWS class). An exam blueprint and sample exam questions are also available for exam PR000004. A “… candidate has an understanding of core AWS services, uses, and basic architecture best practices, as well as proficiency in designing, developing, and deploying cloud-based solutions using AWS. Candidates should have knowledge of developing and maintaining applications written for Amazon Simple Storage Service, Amazon DynamoDB, Amazon Simple Queue Service, Amazon Simple Notification Service, Amazon Simple Workflow Service, AWS Elastic Beanstalk, and AWS CloudFormation.” Single exam, 80 minutes, no prerequisites (Amazon recommends the Developing on AWS class). An exam blueprint and sample exam questions are also available for exam PR000013. A “… candidate has experience provisioning, operating, and maintaining systems running on AWS. Candidates have the ability to identify and gather requirements to define a solution to be built and operated on AWS. Additionally, they can provide AWS operations and deployment guidance and best practices throughout the lifecycle of a project.” Single exam, 80 minutes, no prerequisites (Amazon recommends the System Operations on AWS class). An exam blueprint and sample exam questions are also available for exam PR000014. Amazon has also broken with tradition by adopting Kryterion for exam administration and delivery rather than either Pearson VUE or Prometric. There are now over 150 proctored exam sites up and running, with 3 within 25 miles of my home office. Exams cost $150, payable by credit card or other acceptable means. 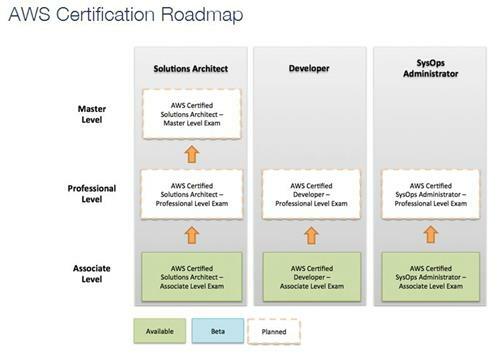 Looking ahead, Amazon is obviously working on professional level exams for all three categories, and even a Master Level exam in the Solutions Architect realm. I’m going to chase down the folks at Amazon training and certification to see if I can get some more information about timing, cost, and coverage of the exams and related training costs. Count on me to report back with more details when I’ve got some to share. In the meantime, it looks like this cert program is off to a very good start.